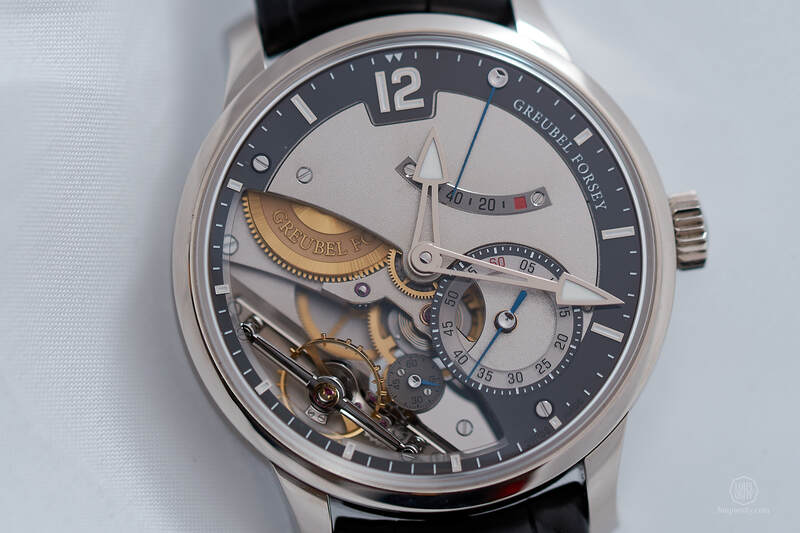 Greubel Forsey presented an airy sapphire version of the GMT and incorporated a dead-beat seconds mechanism in a model for the first time. 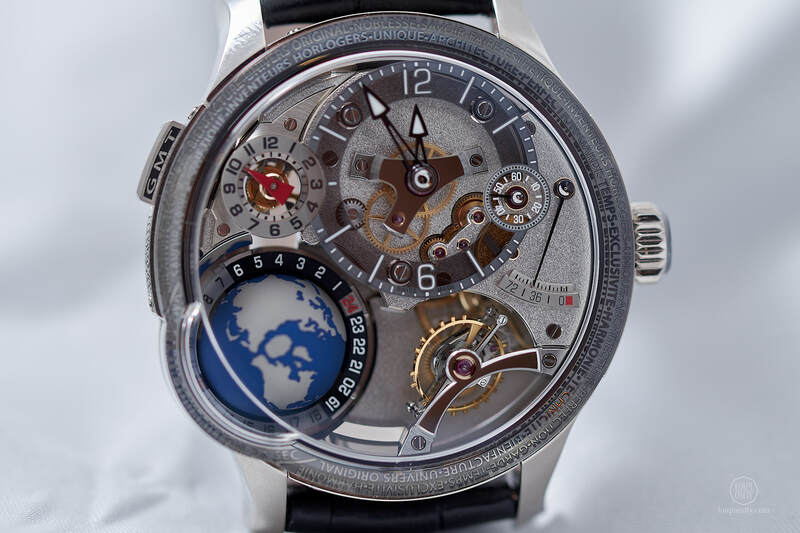 We enjoyed the meeting with the beautiful GMT Earth and the Différentiel d’Égalité at the SIHH 2018. 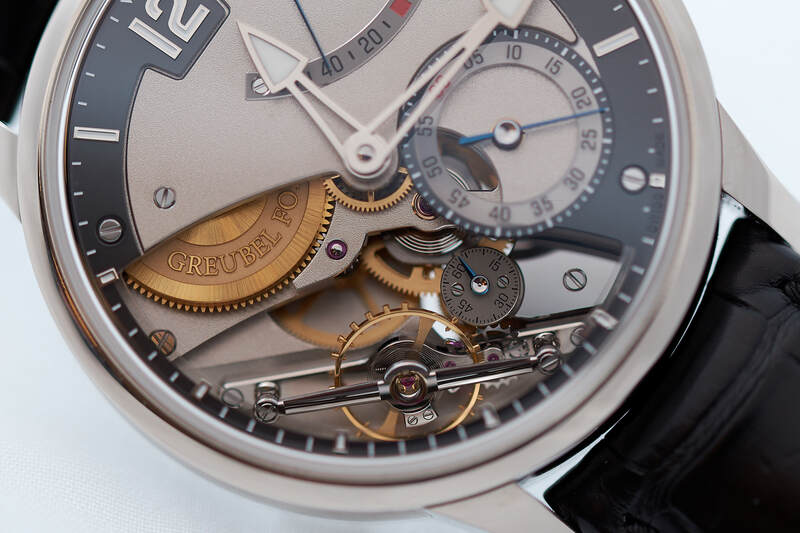 The Greubel Forsey Manufacture lies on the quiet land near La Chaux-de-Fonds where sheep graze in perfect peace on roof tops and you can hear a sneeze from miles away – we visited them recently. It’s funny to think that in this airy surrounding the building, like a neutron star with its enormous gravitational field, attracts and condenses everything within range into these tiny time-objects. They are so unreal and complex that you simply need more time to comprehend what you are staring at. Putting technical aspects aside, in spite of the general wow effect caused by the quality and diversity of surfaces, the aesthetics might be divisive simply because all models have a lot to say. 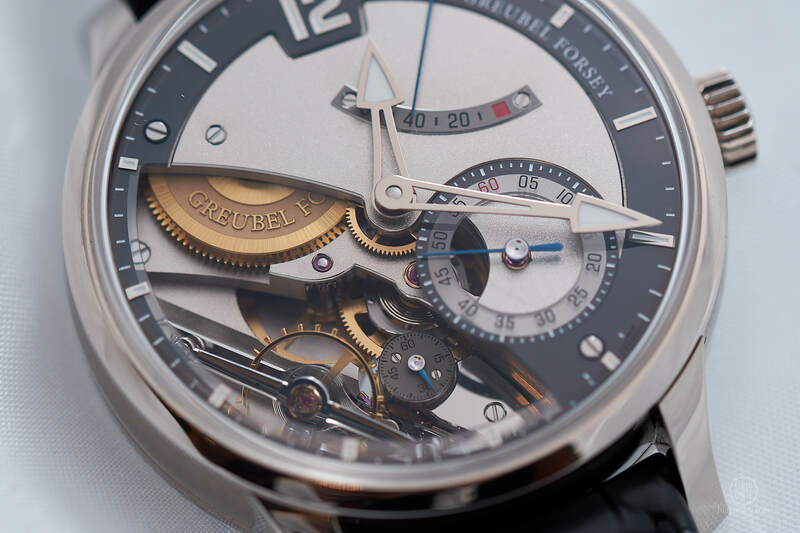 However, vivacity is composed carefully by Robert Greubel and Stephen Forsey – their timepieces actually remind me of the group portraits of Rembrandt where figures take the attention individually, but the scene they are framed in is equally strong. Look at the faces of the Sampling Officials of the Amsterdam Drapers’ Guild, or those on the Night Watch and then the GMT Earth or the Différentiel d’Égalité. I bet you explore the actors one by one until you absorb the entire theatre. 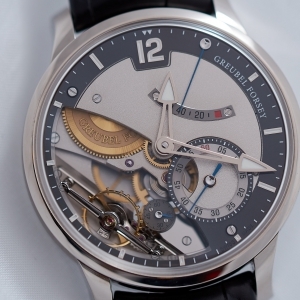 This is the kind of experience you can expect from any Greubel Forsey piece. 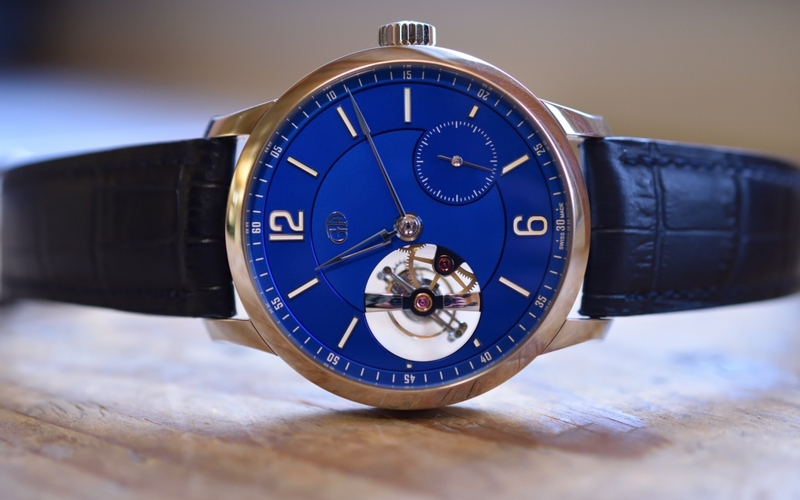 We were lucky to sit down with these entertainers at SIHH. 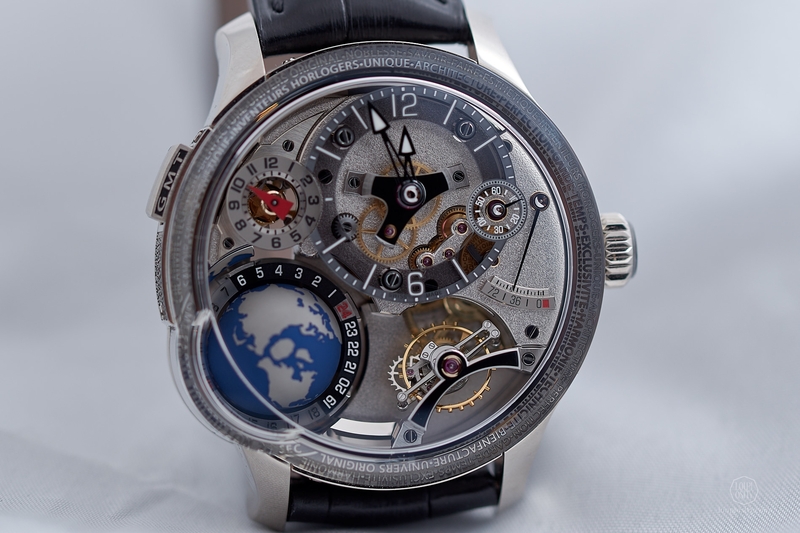 Talking about stars, on this model Greubel Forsey looks at our planet from its outer-space perspective. 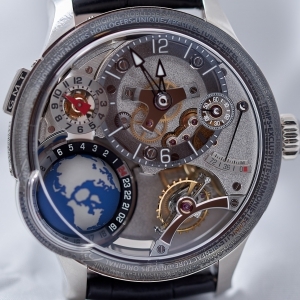 This is a light version of my beloved GMT where foreign time is displayed by a rotating titanium globe. The Earth takes the absolute spotlight in the new version by showing its magical blue not just on the dial side, but also on the back. 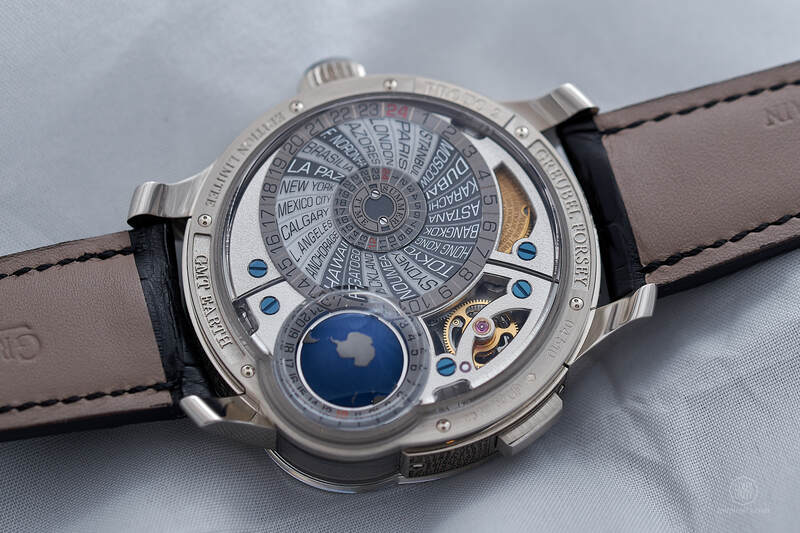 Its rotation can be observed on both sides as well as through a lateral synthetic sapphire window, which breaks up the mass of the white gold case. 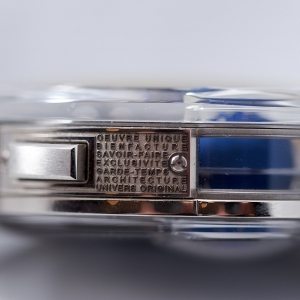 Apropos sapphire, in the 2018 model, the bezel is entirely made of an asymmetrical and rounded crystal. This clear protective material lets the sun light the Earth with basically no obstacle. 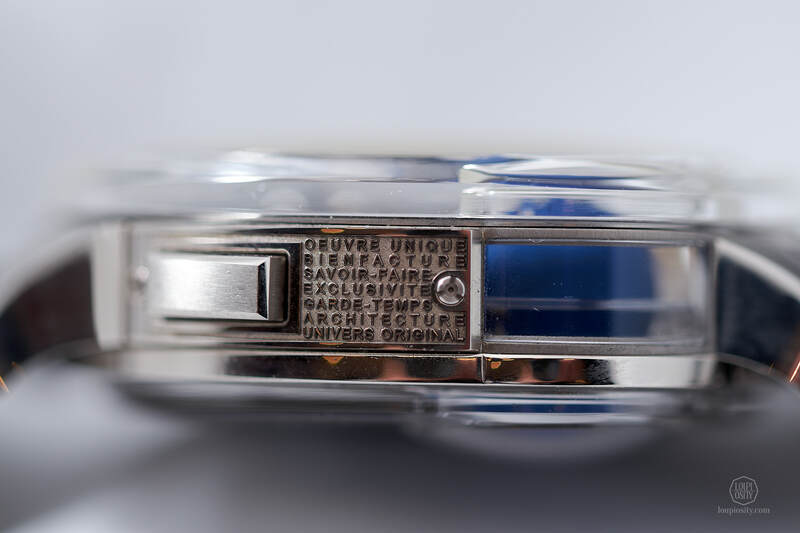 Because of this bezel the manufacture engraved the white gold case underneath with the company’s motto that shines through the crystal. A sapphire ring holds the time scale with golden wheels below that. 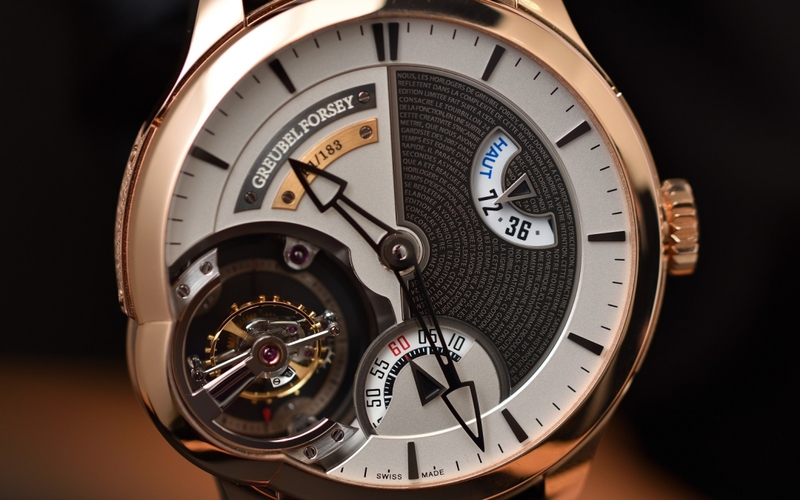 The balance wheel and the entire 24 seconds tourbillon are inclined in 25 degrees. A city disk with summer and winter times revolves beside the Earth on the back. 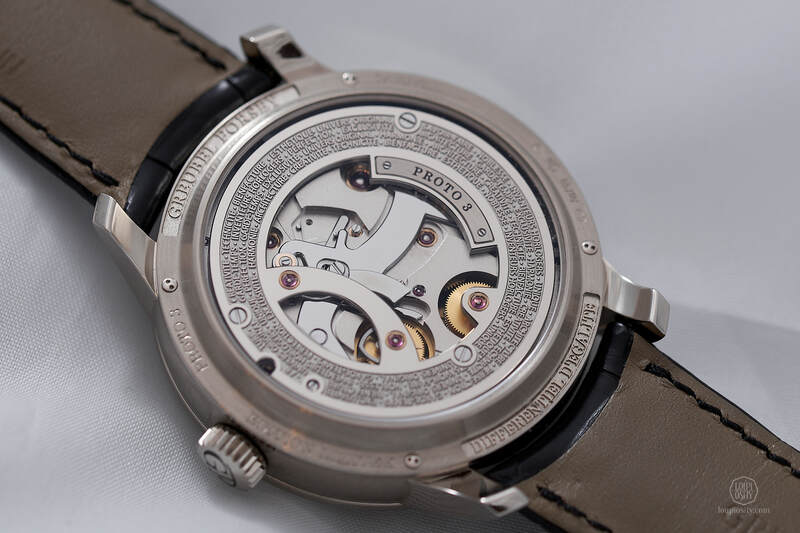 The next timepiece is about the organ that you can see roughly under the 45 second index on the seconds sub-dial, the constant-force mechanism. 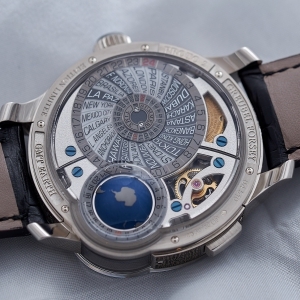 It was first shown in Basel in 2008 and a more advanced version two years later at SIHH. The mechanism ensures that the energy stored by the mainspring in the barrel is transferred onto the escapement in equal power units. 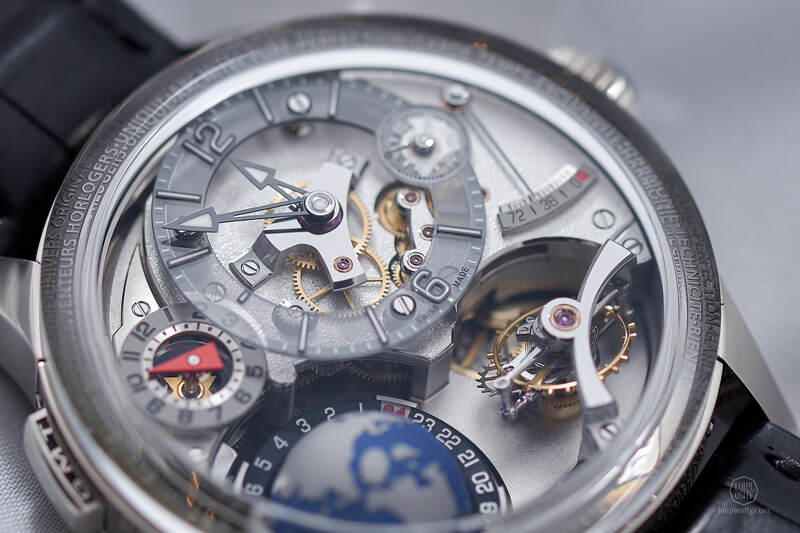 This is important in order to keep up the amplitude of the balance wheel at a constant rate, which greatly determines the precision of the timepiece. 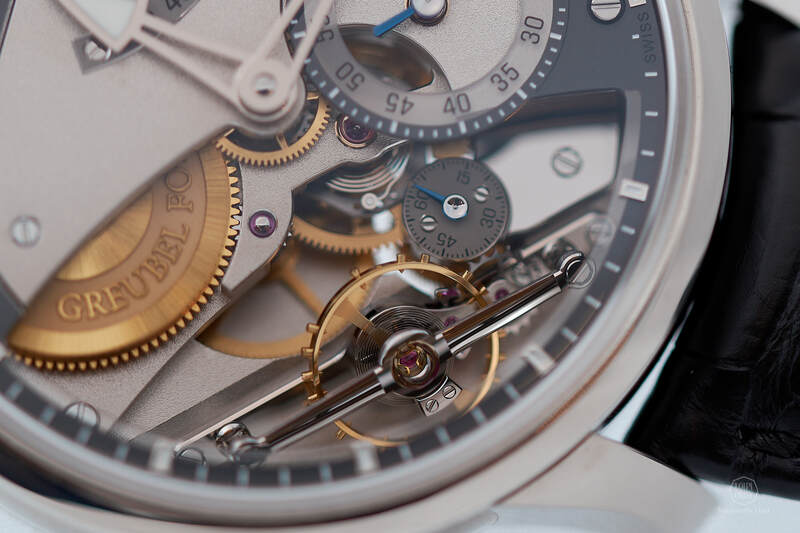 As the mainspring unwinds it tenses the spring you can see under the 45 second index, which releases exactly the same amount of energy every time. 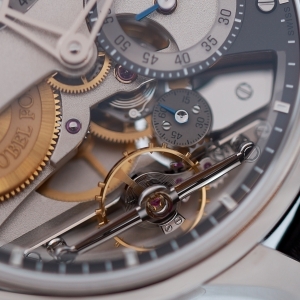 The escapement is inclined in 30 degrees and hangs on a flat black polished bridge. 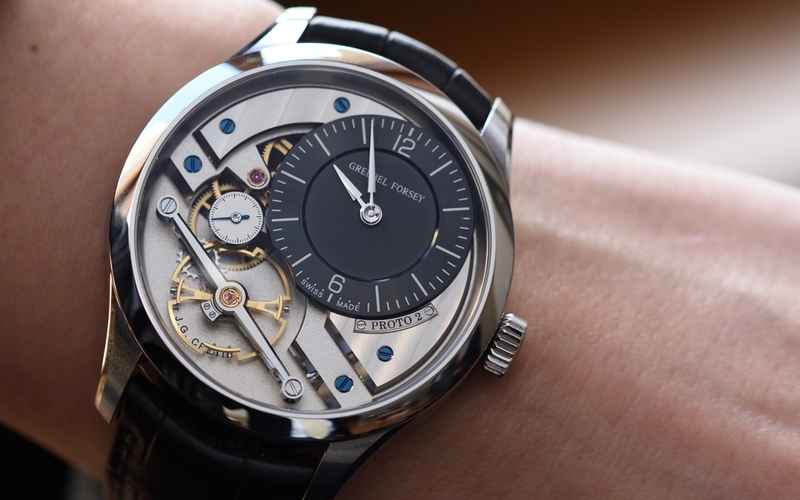 The second hand is hacking for the first time in a Greubel Forsey model. A smaller, continuously running seconds indication is in its shadow. When pulling the crown for resetting the balance wheel gets stopped and the second hand flips back to the start. Like in all GF pieces, the wheel is meticulously regulated by the small screws. 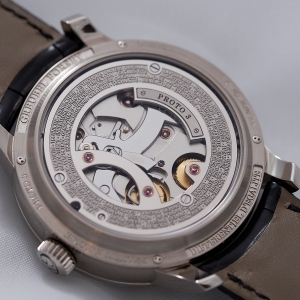 Both novelties are in white gold and are limited to 33 units. 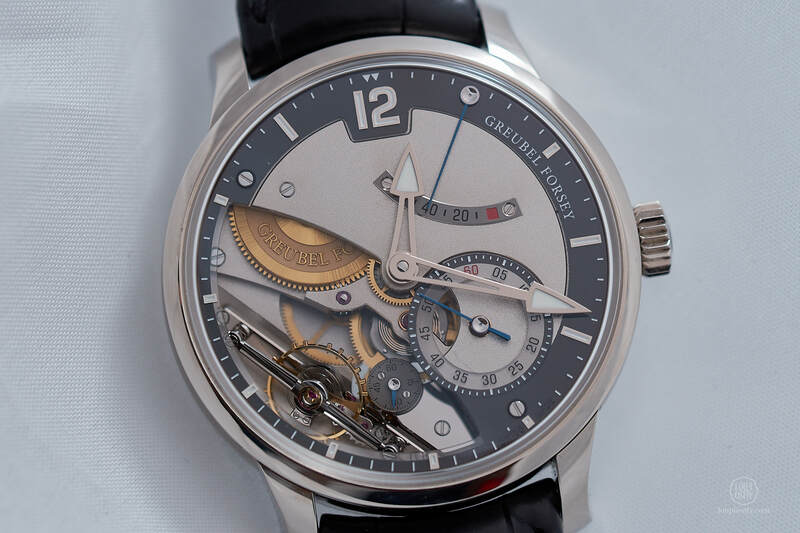 Greubel Forsey Tourbillon 24 Secondes Edition Historique In 2017, after 10 years of production Greubel Forsey decided to retire the Asymétrique, the debuting collection of the 24 Seconds Tourbillon with the Tourbillon 24 Secondes Edition Historique.